Spots for industrial truck brands don't usually come to mind when thinking of great advertising. In fact, we'd be hard-pressed to recall even one. That is until Volvo Trucks debuted their "Live Test Series" campaign where one spot in particular struck a chord, changing the cultural landscape and taking home The One Show's highest honor. Truck. Moving in reverse. The spot hit its mark and both entertained and informed. 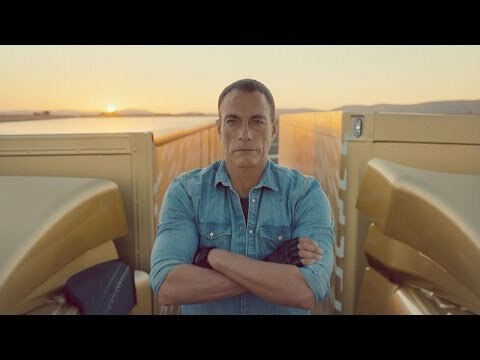 "We see Van Damme doing his famous split between two moving trucks," says Sophia Lindholm, senior art director, Forsman & Bodenfors, "while our target group sees two trucks reversing with amazing precision and stability." The product shown in the ad is the Volvo FM heavy-duty freight truck, which is not meant for lazy Sunday drives through the country or carrying a soccer team to practice. It has to be smooth, precise, controlled. Just like the stunt. The team's objective was to promote Volvo Trucks' new feature: Volvo Dynamic Steering. The four-person creative team talked with the engineers behind the technology and came up with this stunt to best demonstrate its capability. "We realized that it was about driving in reverse with never before seen precision. And that, we thought, was something everyone can relate to. Truck driver or not," explains Lindholm. "After working together with our director Andreas Nilsson and coming up with the idea that someone should do a split between the trucks, the rest was easy. There was only one man for the job, and that was of course Jean-Claude Van Damme." The shoot went off without incident. The team carefully began tests of the stunt months before actual filming began. An additional week of practice took place before the cameras even came out. With drivers prepared and Van Damme as ready as he'd ever be, the team began the two-day shoot. "There were no accidents, but lots of nervousness," says Lindholm. "Volvos expert drivers did a fantastic job. It's not easy driving with extreme precision while having your old action hero standing on your rear-view mirror." In the eyes of this year's One Show judges, "The Epic Split" was creative perfection, so much so that three different juries in advertising, interactive and branded entertainment declared it their top pick. Even more remarkable is the fact that a non consumer-facing brand took over the conversation not just on trade blogs, but throughout mainstream media, as well. As of May 2014, it's the most-watched automotive ad on YouTube, ever, with over 70 million views. Perhaps, though, it wasn't until the parodies started rolling out that Volvo Trucks could really say they made it into the mainstream. So how does it translate to sales? Though the European truck market is well over 100,000 vehicles a year, the majority of people who saw the spot aren't going to buy a Volvo Truck. In fact, they have absolutely no need for a Volvo Truck. But that wasn't the point, really. Now, every time a family is on a Sunday drive or a parent is driving their kid to soccer practice and they see a Volvo Truck in the rear view mirror, they'll think of the most Epic Split they've ever seen.